Soon after hubby and I moved in together we decided to expand our family by getting a dog. After numerous discussions we couldn’t agree on what breed to get so we decided to get two dogs. This is the story of our first dog – Gemma. 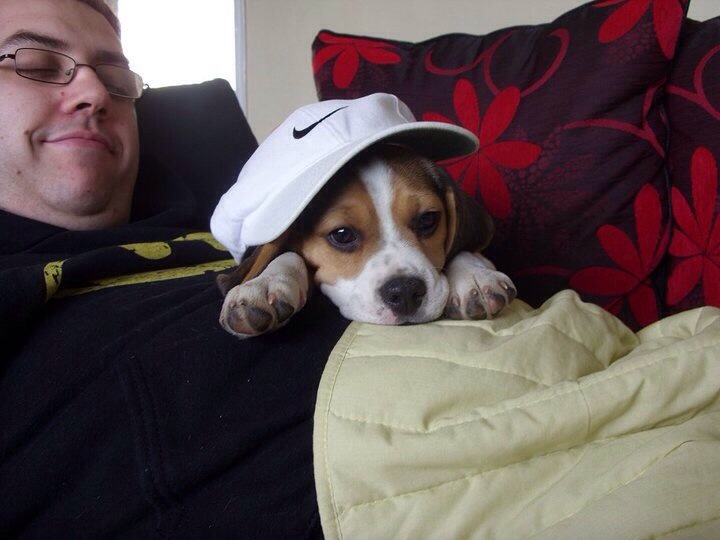 Hubby had decided that he wanted a Beagle mainly because he was a Star Trek fan and loved Archer’s Beagle Porthos in Enterprise. 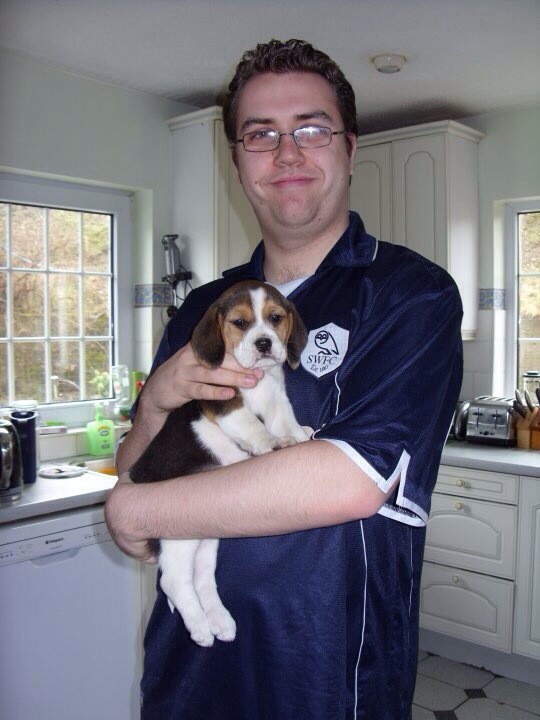 We had a look ar PetsForHomes.co.uk for local breeders who had some Beagles ready to be adopted for April 2011. 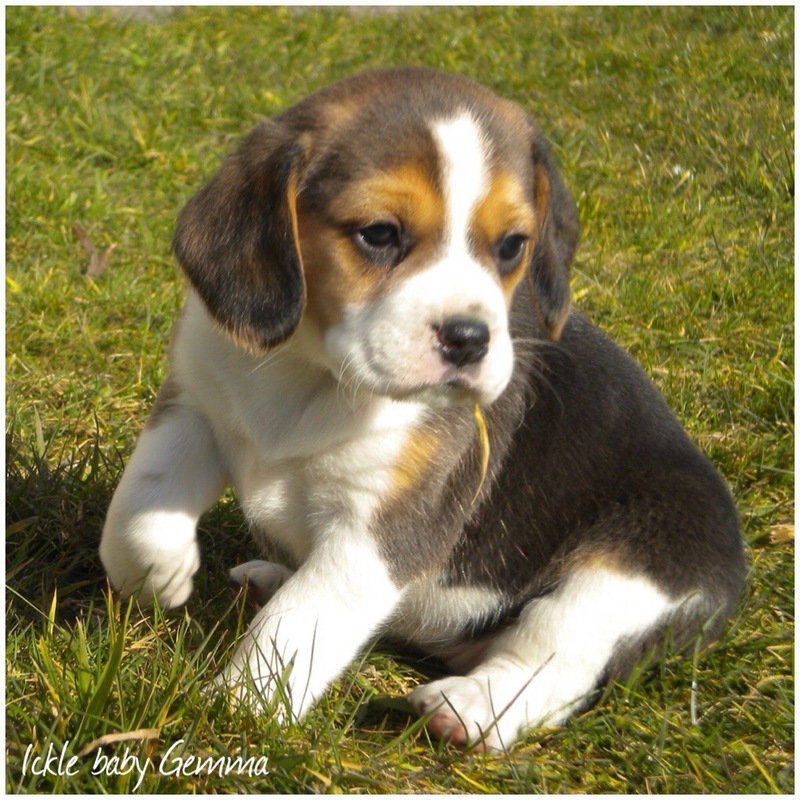 We found a breeder down in Carmarthern, South Wales who had some adorable Beagle pups. We emailed the breeder and asked if we could visit before deciding whether it not to take Gemma. She sent us photos of the female pups and there was one that stood out more than the others. This little beauty! We went to visit her and when we walked into the breeder’s house and fell over 8 Beagle pups running around their kitchen! It was sheer chaos! We saw our Gemma and fell in love! She was adorable! We couldn’t pick her up straight away because she wasn’t ready to leave her mum so we arranged to come back in a couple of weeks. Here’s a photo of hubby with Gemma for the first time! When Gemma reached 8 weeks we went back down South to pick her up. I’ll never forget the moment we left the breeders yard. She was sat on my knee in the front of the car and she looked over my shoulder and started howling. It was quite distressing! The only thing that seemed to calm her down was the song “Underdog” by You and Me at Six (which is quite appropriate since Underdog was a Beagle! So we drove home with that song on repeat – that was a looooong journey – 3 hours of “Underdog, just look at the mess you’ve made…..”!! After we arrived back home we had arranged for hubby’s best friend to look after Gemma for a couple of hours so we could go pick up Megs. Gemma was as good as gold for him and of course she had lots of cuddles from him! When we got back she was asleep in her crate. I look back over photos of her as a young pup and oh my word she was just such a cutie pie! Who could resist that face?! Awww, she was so tiny! I keep telling my boyfriend I want a beagle because they’re the perfect size, but it would be unfair to have a dog with both of us working full time. Trust me you don’t want a Beagle!! No that’s not fair. Shes a gorgeous girl fair play but can be a bloody nightmare when it comes to walkies and food! We thought about the dogs and us working full time. We’re very lucky that we have enough space for them. This is why we got them as little pups so they’d get used to being with each other all day without us from a very early age. She was adorable! She still is. She’s got one of them “I always look miserable so pity me” faces!! She still recognises the song today!